Lewis Wolpert CBE FRS FRSL (born October 19, 1929) is a developmental biologist, author, and broadcaster. He was educated at the University of Witwatersrand, Imperial College London, and at King's College London. He is presently Emeritus Professor of Biology as applied to Medicine in the Department of Anatomy and developmental biology at University College London. He is well known in his field for elaborating and championing the ideas of positional information and positional value: molecular signals and internal cellular responses to them that enable cells to do the right thing in the right place during embryonic development. The essence of these concepts is that there is a dedicated set of molecules for spatial coordination of cells that is the same across many species and across different developmental stages and tissues. The discovery of Hox gene codes in flies and vertebrates has largely vindicated Wolpert's positional value concept, while identification of growth factor morphogens in many species has supported the concept of positional information. In addition to his scientific and research publications, he has written about his own experience of clinical depression in Malignant Sadness: The Anatomy of Depression. This was turned into three television programmes entitled 'A Living Hell' which he presented on BBC2. He was made a Fellow of the Royal Society in 1980 and awarded the CBE in 1990. He was made a Fellow of the Royal Society of Literature in 1999. He is a Vice-President of the British Humanist Association. Wolpert is regarded as a rationalist. In an April 7, 2005 article entitled "Spiked", The Guardian asked a series of scientists "What is the one thing everyone should learn about science?" Wolpert responded, "I would teach the world that science is the best way to understand the world, and that for any set of observations, there is only one correct explanation. Also, science is value-free, as it explains the world as it is. Ethical issues arise only when science is applied to technology from medicine to industry." In a lecture entitled "Is Science Dangerous? ", he expanded on this: "I regard it as ethically unacceptable and impractical to censor any aspect of trying to understand the nature of our world." On May 25, 1994, Wolpert conducted an hour-long interview with Dr. Francis Crick called "How the Brain 'sees' " for The Times Dillon Science Forum; a video of the interview was produced by Just Results Video Productions for The Times. On January 15, 2004, Wolpert and biologist/ parapsychologist Rupert Sheldrake engaged in a live debate regarding the evidence for telepathy. It took place at the Royal Society of Arts in London. In the late 1960s Wolpert proposed the illustrative French flag model, which explains how signalling between cells early in morphogenesis could be used to inform cells with the same Genetic regulatory network of their position and role. He is credited with the famous quote: "It is not birth, marriage, or death, but gastrulation which is truly the most important time in your life." An early book was The Unnatural Nature of Science. 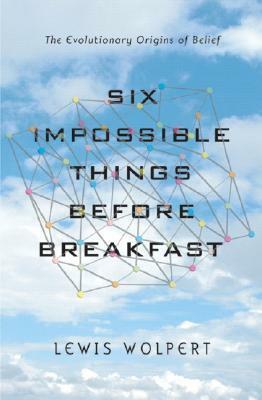 His most recent book is Six Impossible Things Before Breakfast. Lewis Wolpert's plenary address entitled "The Origins of Science and Religion" was provocative, amusing and from a totally materialist perspective. In his view, religion arose from the uniquely human need for causal explanations, and neither religion nor philosophy contributed anything of importance to scientific undersanding. ... ESSSAT is to be congratulated for offering its platform to a strong-minded materialist, but in the end Wolpert proved unable to enter serious debate with the conference theme or its participants.